You can download it here, all in one PDF document. Here is the PDF. This took an enormous effort from a number of team members. 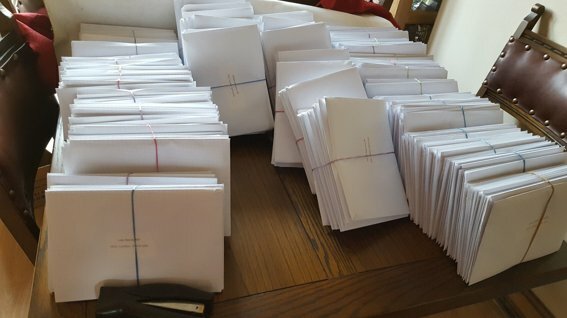 The pack had to be printed professionally, put into envelopes, individual labels printed, sorted into alphabetical order, and delivered to the House of Commons. The direct costs now come to over £1200, without adding in the cost of the time involved in doing this which would double this amount. So far, we have received donations towards this campaign of £238. We have some promises in addition but these haven’t arrived. Today in the Telegraph, Nigel Farage announced that his Brexit Party has received £750,000 in the last 10 days. We just need around £900 to cover the direct costs of a very effective operation striking into the heart of Westminster. Please help with a donation if you can, using one of the quick and secure donation methods below. Thank you so much. Well done and good on you for doing something practical! I get frustrated when people tell me this won't work or that won't work. That just sounds like the perfect excuse for not doing anything. If we don't try, we won't know. I'm happy to contribute to the cost with a donation. Not much I know, but I'm retired. Pity people aren't supporting UKIP! They are struggling to raise £250,000 for election campaigning. Michael, I agree with both your concerns. Nigel is only putting forward MEP candidates for the EU gravy train, not our national elections. These potential, lavishly paid MEPs might be vexatious thorns in the side of the EU Parliament, but they will not materially change ANYTHING - this can only be done here, at the ballot box. We undoubtedly owe Nigel Farage a great deal, but I feel that if he was genuinely, passionately committed to Brexit he would be liaising with and fully supporting UKIP, his former party. His reasons for leaving were questionable and he appears not only to be COMPETING with UKIP, but worse, trying to destroy them; unconscionable at such a critical time in this nation's history when Leavers all need to put aside their grievances, egos and differences and unite in the fight against the enemy, namely, the Prime Minister and a corrupt Establishment. We would present a stronger, more potent force if united. Again, another unsolicited plea for donations - if we want the Team to continue with this gargantuan struggle on OUR behalf, we HAVE to put our hands in our pockets, PLEASE, give whatever you can NOW and regularly. Campaigns simply cannot continue without money. *Please see above expenditure so far of over £1,200 which has not been covered, with only £238 received - a fraction of what is needed! I do feel for UKIP Their vote share was massacred in 2017 GE on the basis of a mis-sold manifesto agreed by a Tory party irrevocably torn over the EU for decades. The Tory manifesto bought them together as a superficial unit - we were well and truly suckered. Fool me once.... I have just registered for the Brexit party on the basis of a newly formed party with a clean slate and non of the baggage that has bogged down UKIP over the past few years with calamitous leadership changes, and questionable leadership decisions on whom to be associated with. Of course, Farage is the driver of the Brexit party and love him or hate him, there can be no denying his commitment to the independence and self governing right of the UK and has never wavered. My deep concern now are diluted votes for genuine Leave parties in a FPTP system that will see the duopoly extremely hard to breakdown in any forthcoming GE. A smaller vote share will concern them, but will have little effect if they can get over the line which they likely will unless there is a concerted drive to back a single leave based party. Brett, I need to put you straight on your above misconception about the reasons for UKIP's performance in the 2017 General Election. UKIP members were deceived and lied to as was the rest of the country and it was decided that we would LOAN our votes to the Conservatives as they were the party in power and they INSISTED that they were committed to delivering the Brexit which UKIP had made possilble and for which all Leavers voted for. WHAT FOOLS WE WERE! There is a saying 'never trust a Tory'! How true. As for questionable UKIP leadership decisions, many would disagree with you and membership is still rising from a low of under 17,000 to over 28,000 currently. If only the Tories could say the same - they are losing members in droves. And I don't know how often this has to be pointed out - Nigel Farage is only fieldng MEPs for Brussels, WHICH WILL CHANGE NOTHING. The political landscape can only be changed by fighting elections in this country and 'draining the swamp! Barbara Jell, you are so right in what you say. I used to trust the Tories, going by the present record, I would never do that again. They are going to get a drubbing at the next elections and quiet rightly so. Not only have they fouled up Brexit (most of them on purpose), but knife/gun/acid crimes are unchecked and certainly not increasing. Lots of attacks on family life with preference to diversity and alternative life-choices. All under a so-called Conservative government. How sad to see a great Britain being trashed by donkeys. Again, Michael Wood I need to dispel a misconception and a falsehood - possibly Farageist propaganda. Far from struggling to raise £250,000 for the election campaign, UKIP have verfiably raised over £500,000 and counting for this purpose. It gives me NO pleasure to say this, but Nigel Farage, whom we considered to be the 'God of Brexit' to around 4 million voters, is now demonstrably attempting to destroy the very Party which has the best chance of delivering the clean Brexit we all voted for. The fact that the corrupt MSM is promoting his (non) party and sidelining UKIP should raise the alarm bells! Nigel is proving to be a 'useful idiot' on behalf of the Establishment and will in no way halt the INSIDIOUS AND INEXORABLE JUGGERNAUT THAT IS THE EU AND THEIR PLANS, IN COLLUSION WITH OUR EQUALLY CORRUPT GOVERNMENT, FOR A FEDERALIST DICTATORSHIP. Shame the MP's clearly didn't read the document. Or at least act on it. Some very interesting facts (I sure hope that they are facts - and I'm sorry to even mention that here!) and you have to wonder why they are not shouted about widely? I wanted to leave - I want to leave and I don't care if it is with a deal (Not the current one on offer) or no deal.